Phoresia is pleased to bring to you the first in a three-piece series about surf travel by bike. Author and traveler Scott Paynton writes about how we as individuals can make change simply by considering our daily actions. It started off as a simple idea. My friend Mike and I wanted to go on a surf trip. Nothing strange about that! However, we have grown increasingly alarmed at how much we drive around looking for surf and the environmental impact this has. It’s been much easier to recognize the amount of gas we burn as fuel prices have now pushed $5.00 a gallon in our area. As a result of our increasing awareness and concern, Mike and I wanted to do our trip with minimal environmental impact. How close to a zero-carbon footprint could we come? I have cycled up and down the coast many times. As I passed amazing surf day after day on my last trip, I wondered if it would be possible to tow boards and gear behind bikes. It felt like I was already carrying enough of a load just carrying gear. What would boards, board bags, and wetsuits do to the weight? I threw the idea out to Mike and he was all for it. 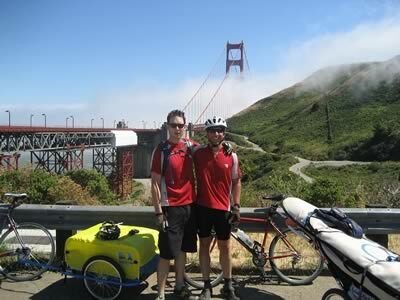 We began to plan out all of the details of our trip, preparing to do the ride over a nine day period in May, 2008. To be honest, we were doing this trip for ourselves in a way that matched our increasing environmental conscientiousness. All we really wanted was a few days carved out of the year to bike, surf, and spend time with an old friend. All seemed perfectly simple as we began to put together the pieces for a successful trip. Then, at 4:00 a.m. on a February morning I woke up and thought, “I wonder if we can get sponsors?” I ran the idea by Mike and he was all for it. We began a letter writing campaign to environmentally friendly gear manufacturers letting them know what we were doing, why we were doing it, and asked if they would like to donate sustainable gear to help us on our journey. While having new gear is great, it was our intent and promise to use the donated gear to educate others about our environmental impacts as consumers and sports enthusiasts, and to demonstrate the alternatives that are available. To our surprise, we received sponsorships from 22 organizations! In fact, all of our surfing gear was produced using the latest in sustainable manufacturing. What we were seeing taking place was a real-world example of systems theory. Systems theory is easily summed up with a simple definition: “The whole is greater than the sum of its parts.” Put another way, anything we do as individuals impacts others around us, as well as the environment in which we exist. Discussions about global warming are, in reality, debates about a global version of systems theory. We are becoming increasingly aware that none of us truly exist as individuals without impacting others. Many cultures have long-recognized the importance of thinking from a collectivist perspective, looking out for the good of the whole rather than pursuing the good of the individual. For those of us born and raised in cultures that value the experience of the individual, we are beginning to learn the larger consequences of trying to exist outside the scope of systems theory. What does this have to do with a bike and surf trip? The trip began as an individual pursuit for Mike and me. Let’s face it, that’s how we’re taught to think. If we want something, we should go for it, right? Our original intention was to purchase the products we needed, pursue our own agenda, and do the trip for our own self-gratification. There seemed to be nothing wrong with this line of reasoning as it is how we have been trained to think about our lives. The old Nike motto sums it up nicely: Just Do It! Why not? Just Do It! 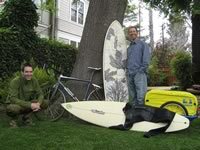 But, what are the consequences of that approach, even for a simple bike and surf trip down the coast of California? As we gathered sponsors for the trip, we started to realize that a much bigger reality was beginning to occur — the building of community. Those we asked for help from were not companies, but people with whom we now have a personal connection. Most remarkable about the ongoing building of community was its global nature — why should companies from England and Australia care about two guys biking and surfing down the coast of California? As the sponsorship campaign and trip planning continued, I kept coming back to one word — generosity. 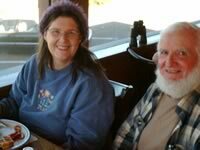 Going back to systems theory, each of our sponsor’s actions impacted Mike and me, and ultimately, as someone taking the time to read this article you are now being impacted in some way by the actions of people you will likely never meet. We can never fully realize the full scope of our actions. We can only hope that our actions do more positive than negative. Even though our goal was to use this trip to educate people about living life in sustainable ways, we still felt like we needed to give something back. Mike’s dad passed away from lung cancer a year ago. The tragedy of the death of Mike’s dad was that he was not a smoker. Obviously, other environmental factors contributed to his death. More and more, the lesson and goal of our trip became evident: Everything is connected and creates a sum that is greater than each of us as individual parts. In support of our trip, over 40 people donated to the American Cancer Society to help us raise $2000. We departed on May 15th from Fort Bragg, CA; the northern-most major town on Highway 1 in California. Our destination was Mike’s house in Santa Barbara. Our community continued to grow as we slowly worked our way down the coast. People bought us breakfast, donated their computers for us to use, gave us complimentary and discounted rooms, let us stay at their houses, did mechanical repairs on our bikes, and bought us beer. Most importantly, people simply took the time to stop and talk with us about what we were doing. They listened to our stories, and told us their stories. Even now, our community grows as people hear or read our story and respond back. Whether we see any of these people again or not, all of our little actions have combined to connect us in ways that have the potential to change lives, even in the smallest of ways. All of our little actions have created a sum that is so much more positive and productive than each of us could have ever achieved on our own. We spent nine days on the road. Some days were more exhausting than others. We didn’t surf as much as we wanted because our schedule was tight for the amount of riding we had to do. But, we got three great surf days in, and saw so many incredible surf spots. Next time, we’re slowing the pace to allow for more surfing. Along the way, we had a ridiculous amount of fun, suffered an incredible amount of pain, and learned more than we could possibly relate to those around us. The icing on the cake for me was being able to rent a Toyota Prius to get back home to northern California. The fact that car rental companies are carrying hybrids is yet another small sign that we are moving forward in the right directions. The more each of us acts, and asks others to act, in ways that produce the least amount of damage to the environment and others, the more we will see changes like hybrids at car rental companies. The whole is greater than the sum of its parts. Knowing that I play a small, but consequential, part in the global system makes me continue to consider the impacts of my actions before I do them. Do I really need to drive to surf when I know it probably won’t be good? Rather than complaining that surf cams make my local spot more crowded, can I appreciate that these kinds of technologies have the potential to keep me from driving around looking for surf because I can see it from my home? Is it really that hard to rely on my friend who lives right by our local break to call me after he has checked the surf before I get in the car to meet him? Every action has a consequence, no matter how small. A lot of small negative actions produce major negative impacts. A lot of small positive actions produce major positive impacts. So, the question is: How can you play your part in creating a sum we can all live with? Scott T. Paynton is a professor of Communication at Humboldt State University, with an emphasis in organizational communication. During his free time you can find him surfing at his local breaks. Ah such a trip has been bouncing around in my head for the past year or so. There was a fantastic article in Surfer’s Path or Surfer’s journal over a year of so back that featured a bike/surf trip to Southeast Alaska/B.C. They were able to ferry out to some islands then explorer/surf/camp by bike. They had modified some kid buggy trailers to carry boards and gear. I really liked how you divided up the boards and gear between to bikes and specialized trailers, that makes a lot of sense. But people can also do it on the cheap by converting craigslist kid trailers to carry boards. In my opinion Surfboards and bicycles are the two greatest inventions of all time. As a grom in Santa Cruz my best friends dad built us board trailers that hooked to our seat posts. Guys always wanted to buy them from us, but to us they were worth their wait in gold since we were to young to drive. This was back in the late 80’s when such things were not really around. Cool that such products do exist now. I am thinking of an Island in western Europe that would be perfect for such a bike/surf trip. Hint: think green hills and black brews. One of my most memorable trips was a bike tour there, wish I had a board with me. Bike touring is the perfect speed to soak it all in. Walking to slow, Driving to fast. and i thought riding my bike with my board under arm for the 35 years+ was being eco-cool! can i come along next time? and ireland wuld be very neat in late summer according to my brother in law who just did a cycle tour of the coast there. Scott is doing 2 follow up pieces to this one on their trip so look for those in the near future. Maybe he can chime in on the gear questions. Just found out about this cool “Cycle For The Sea- SF to Monterey” happening in a week or so, alerted through Surfrider email. Bad timing for me this year but it sounds like a good time. deebow thanks for the Malloy article. God what a life those guys have!